"God Save the Queen", or "God Save the King", is an anthem uised in a nummer o Commonweel kinricks; it is the naitional anthem o the Unitit Kinrick, ane o the twa naitional anthems o New Zealand, an the ryal anthem o Canadae, Australie, Jamaica an the Isle o Mann. In kintras no previously pairt o the Breetish Empire the tuin o "God Save the Queen" haes been uised as the foonds for sindry patriotic sangs, tho still for ordinar connectit wi ryal ceremony. The author o the sang isna kent, an ayont its first verse, that is conseestent, it haes mony historic an extant versions: Syne its first publication, different verses haes been eikit an taen aff an, e'en the day, different publications includes sindry walins o verses in sindry orders. In general anerly ane, or whiles twa verses is sung, but on rair occasions three. Ane or twa baurs can form a pairt o the Vice Regal Salute in Commonweel kinricks ootwi the Unitit Kinrick an aw. The wirds o the sang, lik its teetle, is adaptit toae the gender o monarch, wi "Keeng" replacin "Queen", "he" replacin "she", an sae on, whan a keeng rings. In the Unitit Kinrick, the last line o the thrid verse is chynged an aw. ↑ cf. 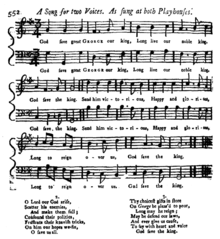 the versions in the hymn beuks English Hymnal, Hymns Ancient and Modern an Songs of Praise an the version at the wabsite royalty.gov.uk. ↑ "Monarchy Today pages at royal.gov.uk website" (HTML). Retrieved 2007-04-01. Wikimedia Commons haes media relatit tae God Save the Queen. This page wis last eeditit on 9 Mairch 2018, at 01:27.